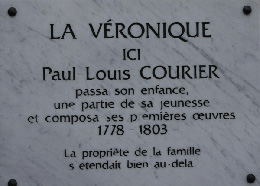 n the 10th of April, 1825, with his wife Herminie in Paris, Paul-Louis Courier left La Chavonnière on foot at about 4 p.m. to meet his gamekeeper Louis Frémont. He had made the appointment that morning for the Larçay Forest at a place known as “la Fosse-à-la-Lande.” Both men met as planned at about 5 p.m. But a third man was present: Symphorien Dubois. He was Courier’s carter. His brother, Pierre Dubois, too close to Mr.s. Courier, had been dismissed by his master in July of 1824. And so Pierre Dubois had sworn that he would get his revenge. Symphorien shared his elder brother’s hatred. Symphorien quarreled with Courier and threatened Frémont with death if he did not kill the man who employed them. Worked over by both brothers for several weeks, his good sense watered down by drink, disturbed by his companion’s imprecations, the gamekeeper took aim at his master and killed him at point-blank range with only one shot. Then four others fellows appeared: three of them known to Pierre Dubois and the fourth, a stranger to those parts. Discovered the following morning, the hapless writer’s body, lying flat on the ground, was carried to the Guessier’s farm. There, in the early afternoon, the forensic pathologist carried out an autopsy in the presence of the King prosecutor, his substitute and the representative of the investigating magistrate. The funeral was held on the following Tuesday at 5 p.m. at the Véretz church. Herminie Courier arrived at La Chavonnière at the end of the day, on April 20th with the eldest of her two sons and her mother, Mr.s. Clavier. The public notary drew up the inventory of the family estate and confirmed what was being whispered by everyone: the couple was crippled by debt. For two years, Herminie strived to manage the properties. But she understood that she was loosing her time and her energy. Furthermore, her husband’s tragic death and the suspicion of her complicity in the assassination, which later materialized against her, convinced her to break with the Touraine. She sold La Chavonnière with the adjoining land in July of 1827 and probably the forest at the same period. During the last war, resistance movements had Paul-Louis Courier’s lampoons reproduced and circulated. Nazis stupidly took revenge since a soldier emptied his machine gun on the plate of the forest’s memorial. The city of Tours restored the writer’s good name by replacing another identical plate but…white! Should we see a symbol in this, the symbol of the transfiguration of a man who inspired all kinds of feelings but indifference? and trustee Jean-Pierre Lautman, secretary. erminie Courier came up against an obstacle. She wanted her husband to lay in the Véretz cemetery for ever. Now, at that time, burial plots in perpetuity were not used in villages. Therefore, Mr.s. Courier wrote to the mayor Archambault de Beaune on November 15th, 1825 to obtain such an arrangement. The authorization delaying too much, she resolved to refer the case to the prefect on October 18th, 1826. A royal edict from June 3rd, 1827 granted the burial plot in perpetuity for a fee of 200 F to be paid to the village and a donation of 100 F for the indigents. Véretz had to create a charity office to receive this sum. Paul-Etienne, Paul-Louis’ son, was buried at his father’s side. Unlike in the case of his father, a small cross is engraved on his stone. Behind Paul-Louis Courier’s grave is the one of Doctor Herpin (and his wife) who assisted Herminie during her two childbirths at La Chavonnière. The death of Herpin was declared at the town hall of Véretz by… Paul-Etienne. A row above them are two others: the one of Jean-Paul Louis Courier de Méré (1866-1932), son of Paul-Etienne and that of Blaise Courier de Méré (1903-1927), the grandson. We note that Paul-Louis, like his father Jean-Paul and Paul-Etienne, voluntarily left out “de Méré” from their patronymic. 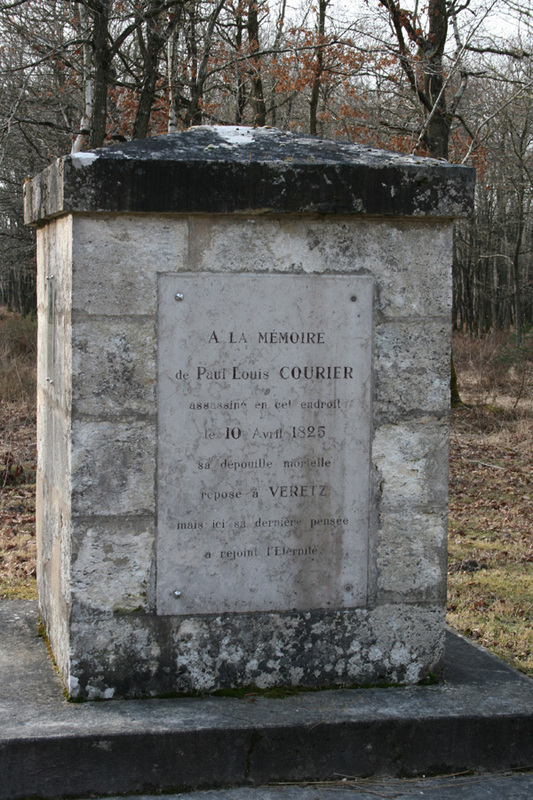 The monument of Larçay Forest was erected in 1828. It is not a cippus but a masonry block of 1,80 m by 2,00 m high. Probably Mr.s. Courier changed her mind upon the advice of the craftsman who made the two monuments. A black plate was affixed to the front of the cenotaph. The plate was destroyed by Germans during the WWII because the Resistance fighters from Touraine had clandestinely circulated excerpts from Courier’s last Letter to Le Censeur. The city of Tours repaired this damage by replacing it with a … white plate! In April of 2001, at the SAPLC’s request, the municipality represented by the mayor Jean Germain unveiled a small resin plate which allows passers-by to know the significance of this place of remembrance. he monument’s promoter was Eugène Rigault, a town councilor in Paris. He told his political friends about his project and got the support from notable people such as Edmond About, Francisque Sarcey and Daniel Wilson. A fund was started. The monument was designed by the architect Eugène Viollet-le-Duc, son of the writer, and Paul-Louis Courier’s friend, Emmanuel Viollet-le-Duc. 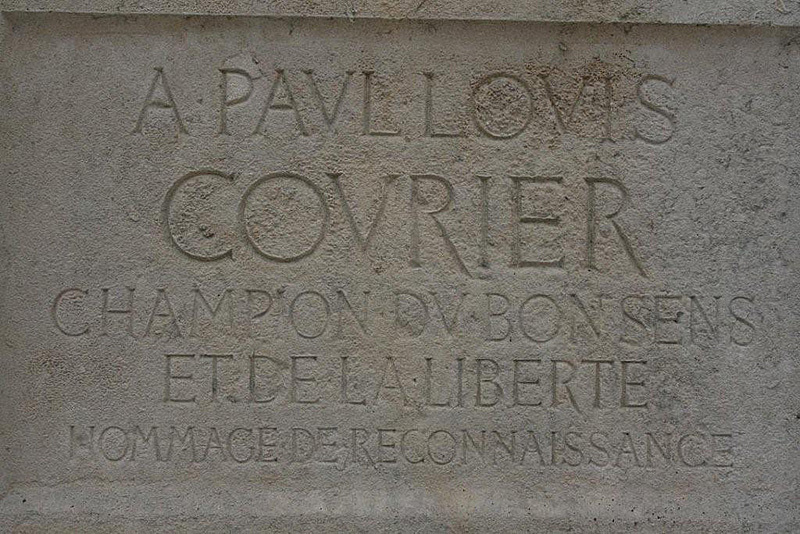 In the mind of Rigault and his friends, the monument must naturally be erected on the spot of Paul-Louis’s gravestone. Paul-Etienne Courier, the illustrious deceased’s elder son was opposed to it. He wrote saying as much from his house, then located in the department of Doubs, to Véretz’s mayor on July 14th, 1876. The day before he sent the letter, Véretz’s council had decided to allocate in perpetuity a site of 8 m² (86.11 square feet) located on the public square with the purpose of installing the monument to be. To face the expenses required by a city celebration offered for this occasion, the council voted on an amount of four hundred francs. On July 16th, 1876, at 2 p.m., Pascal Duprat and Viollet-le-Duc put down the first stone to the music of Lisette from Béranger. There were regattas on the river Cher, music on the water, a torchlight procession, fireworks, and a free ball. The inauguration took place on July 28th, 1878. In spite of unstable weather, seven to eight thousand people attended the event. The monument is made of hard stone from Chagny. In 2007, during the renovation of the square, the monument was slightly moved towards the east and received a laser cleaning to avoid the stone’s damage. 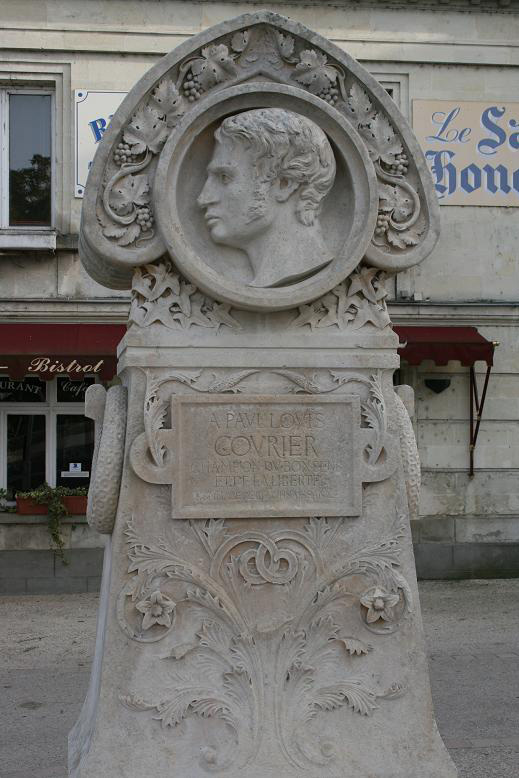 We will find below the critical article of the Journal d’Indre-et-Loire reporting the inauguration of Paul-Louis Courier’s monument on the Véretz square. Born under Le Directoire, this newspaper, the oldest one of Indre-et-Loire, had a circulation of 3,500 in 1871. After putting forward an uncompromising opposition to the government of the Défense Nationale, it rallied itself to Thiers’ conservative republic, reserving its shafts for Gambetta who it will qualify in 1872 as an “undertaker’s assistant of the democracy.” At the beginning of the IIIrd Républic, its editorials were sharply redacted by the journalist-printer Jean-François Ladevèze, made editor of the Journal d’Indre-et-Loire immediately after the 1848 February Revolution. Some years before his death at Chambray-lès-Tours in August 1884, he was replaced by Jules Delahaye, a favorite of Angers’ bishop, Monsignor Freppel. 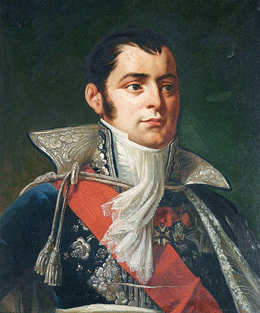 Delahaye, loyal partisan of the count of Chambord, got closer to the Bonapartists after the death of the pretender of France’s throne. This antiparliamentary assailed prelates willing to accept the government, which provoked turmoil in Touraine. The archbishop of Tours was among them, and Mgr Freppel was the most determined adversary. Elected deputy of the Chinon district in 1889, confirmed in 1890 after threat of invalidation, Mgr Meignan sat beside Mgr Freppel against the partisans of those rallying to the Républic, spearheaded by the cardinal archbishop of Paris Lavigerie, who Léon XIII will personally support in February of 1892... The inauguration of the monument occurred when Delahaye replaced Ladevèze. of the City Hall of Paris. Still under the emotion of the splendid feast I attended, I am sending you these few lines hastily written. This feast – is it the result of chance, is it the result of a calculation? – coincided with the anniversary of the death of Robespierre and his accomplices, whose heads fell under the iron guillotine. Chance or coincidence does not change anything and I will not dwell on my subject. Shall I describe for you the splendid adornments of the village? Shall I tell you of the four dozen three-coloured flags put in a row on the public street? Shall I describe for you the magnificent shack erected next to Courier’s monument in which the guests would sit? No! You can see everything from your office and you can already intuitively assess the efforts done here to give to the small parade of the day all the splendour it is due. The names of the four deputies of Indre et Loire, Messrs. Belle, Guinot, Joubert and Wilson, then the name of the architect Mr.. Viollet-Leduc and the names of the sculptors are engraved in the monument’s back. No date. We admitted that this masterpiece did not need it. We notice in this inscription the use of the letter V for the “U.” It is from Mr. Viollet-Leduc, an inexcusable anachronism, which at the time that the architect was young, would have given him a dunce’s cap. Mr. Viollet-Leduc, man of sacristy in the past as the radicals used to say, and today diehard republican (TN: meaning supporter of the Republic) could allow himself these liberties when he was restoring old churches and gravestones; but we cannot understand this erroneous childishness on a monument erected in the middle of the 19th century. I will add however that this architectural naivety matches wonderfully the oh-so-ingenious plan of the small construction; a drinking fountain whose summit imitates a gendarme’s hat; and under this hat, exhibiting the sorriest expression in the world, is Paul-Louis Courier’s portrait. Moving along to the feast. I hear the brass bands of Azay-sur-Cher and Montlouis, which arrive headed by banners and trombones noisily deployed. They play patriotic tunes; everyone acclaims them; considering the row they make, this is fair: we can not deny the obvious. Indeed we can see Messrs the organizers and their guests. There are at least 250. At the head Messrs Wilson and Belle move forward with all the dignity called for by the occasion; M. Belle, blooming with health ; M. Wilson, looking bilious, the complexion turning in the yellow. Mr Wilson is unwell, isn't it? It is due to the works and waking states and perhaps to the laborious organization of the feasts! Let us hope, ô my God!, that this indisposition will have no grave consequences! Organizers and guests settle down in the stand or the shack I told you about. All this requires some time, for, what will maybe surprise you in this time of equality, a selection is made which shines a light on certain people whereas others are relegated to the last seats . Sat in the center, and in the places of honor, I see MM. Belle, Guinot, Joubert, Noël Parfait, Tassin, de Mahy, Cantagrel, Fouquet, Laisant, Léon Renault, deputies; Jules Simon, Garnier, Palotte, Lucet, senators; some members of municipal council of Paris ; M. Daunassens, prefect of Indre et Loire ; the sub-prefect of Loches. A helpful neighbor still indicates me the presence of MESSRS. The assistants of the mayor of Tours, several members of municipal council of this city, mayors and assistants of the municipalities of neighborhood, some professors of the high school of Tours and some journalists. Two characters catch more particularly the eyes; They are two Arabs, dressed in their national costume. Who are they ? Who brought them?I admit my ignorance to this subject and I do not want to worry about it. The session is opened. Mr. Belle, president, stands up; he is going to speak. Silence. First Mr. Belle thanks the guests who have answered Mr. Wilson’s invitation, and with his hand finely gloved he makes a gesture that accompanies most gracefully the expression of his gratitude. Suddenly his forehead darkens; lightning crosses his eyes; thunder is going to rumble; the orator evokes the past with shouts that make Courier’s monument shake on its base. He recalls the time when a reactionary government would not have tolerated the present meeting and congratulates himself for the present situation and for the era of liberty. Having pulverized his enemies, he wants to take the sun as of a comparison which he wants to make. But the sun refuses to be his accomplice; it hides, the traitor, behind clouds. Mr. Edmond About, placed behind the speaker, smiles roguishly by hearing this original invocation to the sun, whereas Mr Belle pursues his demonstration, in which the public includes absolutely nothing. Let us hope that the speaker will have better understood it that we. After a short piece of music, played by the brass band of Montlouis, Mr. Belle gives the floor to M. Raoul Rigault. But he make a mistake and say; Mr Eugène Rigault. Mr Rigault member of the feast organization committee, reads a kind of printed report in which he gives peculiar praises to his colleagues. Later, as good friends, be sure they will generously return the favour! Who’s next? It is Mr. Edmond About who also reads. 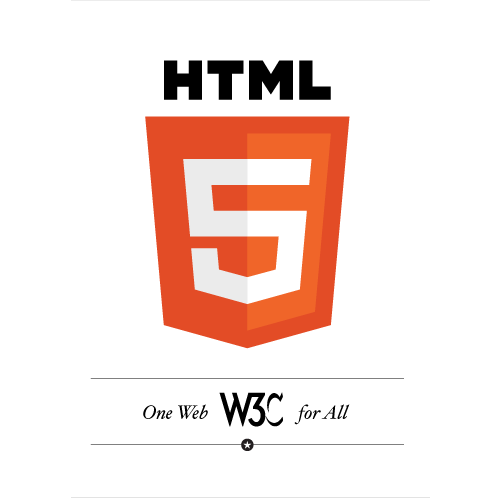 The thing is printed, it will be easier to read. But the voice of the speaker goes hoarse in the first words ; he has a lump in his throat; We ask for a glass of water, which fairly is waiting. The speaker drinks and engages in a savage attack against the clericals using various passages picked from Courier’s lampoons. I will allow myself to point out an omission to him: in his quotations he forgot to point out a good sentence of the famous lampoonist which says that at his epoch, there were people “who always went where there was food.” Would Courier have predicted, by chance, the case of a certain character, who Mr. About knows well, and who, after eating with gusto at the palace of Napoléon the IIIrd, joined the side of the Republic where he eats on with the same appetite? After Mr. About, Mr. Léon Renault takes the floor. We are now in the presence of a serious writer. It is possible not to share the orator’s opinions, but everybody will recognize that he pronounced a well written speech in an elegant form. He endeavored mainly to bring out the influence of Courier’s works on the events of his time. In the middle of necessary historical and biographical details, he said some words about his hero’s military life. Mr. Léon Renault should reread some good Courier biographies in order to improve himself on this point. Let’s hear another speech; it is the fifth of the feast, and I hear that it is not finished! The new orator is Mr. Jules Simon. It is a known, very flexible, very skillful talent; But you would not should judge him on the sample which he gave us today. This sample is indeed so thin ; and I wonder if Mr. Jules Simon, did not want to have fun little at the cost of his public.He showed himself so familiar that it looked like hardly a small comedy of lounge, a parade. Mr Wilson also has his part in this distribution of familiarities, congratulations. Two or three voices on the square shout ; Hurrah for Wilson ! Can you believe it ? This shout does not find echo among the guests. They save themselves probably for this evening, after the good dinner which is simmering to Chenonceau. The series of congratulations depleted, Mr. Jules Simon leads us to the World Fair; he talks about a hammer, an anvil, the wonders of photography, and then about works exhibited by Schools of France. Then he agrees to return to Courier and tells us that, if Courier could relive a moment, he would be quite surprised to be celebrated by the republicans, he who was definitely not a republican. Mr. Jules Simon hurries to add that though Courier was not republican, he worked a great deal, (unbeknownst to him) for the Republic when he wrote texts which hastened the advent of an era of freedom. With these last words, everybody shouts: Long live the Republic! And here are good reds reconciled with the speaker who, Happy to have found the good way, continues to wear out until the abuse of the expressions of freedom and Republic. 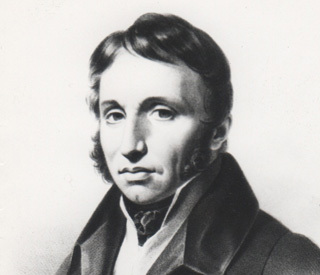 The brass band of Azay-sur-Cher plays the Marseillaise, and then an actor from Paris, Mr. Coquelin, declaims some verses dedicated to Courier written by Mr Poucher or Foucher. Upon this nice piece that the crowd hears with the most total indifference, the meeting ends and the guests head towards the train station where the train to Chenonceau awaits them. Véretz, the 29th of July. According to what a neighbour told me, there were 15,000 people at Chenonceau. In the gardens, it was difficult to move in the middle of the crowd. About twenty maidens dressed in white, with pink or blue belts, were selling pastries; it was totally poetic. The onlookers which had been lucky to have admission tickets were able to penetrate into the castle... after the dinner of the guests of Mrs Pelouze and Mr Wilson and contemplate the beautiful service and the uncountable glasses of which we had made use. An amply supplied buffet was offered. Everyone could eat, as they wished and without spending a penny, cakes, fruit and other good things. Liqueurs and exquisite wines were offered a plenty, and we could made the most of it always without paying! Many people widely took advantage of this godsend and I want to believe that at a certain moment, at a right moment, you understand me, they will show their gratitude. At 11 p.m. or 11.30 p.m., all the noise ended, all this fires, which have set ablaze the old house of Catherine de Médici, went out and the guests went back by train, some to Paris, others to Tours.